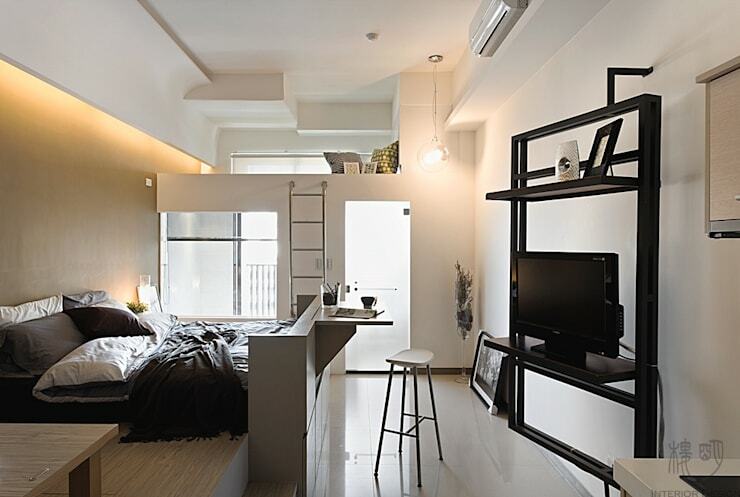 Compact, creative and unique: today’s feature apartment is tiny and brilliantly designed. Let’s face it, living with another in close quarters can be a testing and often difficult experience, even more so when space is limited. Narrow, cloistered and lacking space, this dwelling should feel rather uncomfortable, but it doesn’t! Our first impression of this apartment is definitely to do with its size. Let’s face it, this place is small. However, as we’ve learnt time and time again here at homify, excellent things often come in small packages. Living in an Asian city often means compromising on space, but it doesn’t have to mean your life is messy, chaotic or jumbled. Far from it, this apartment shows us that storage is the key to efficiency, and some ingenuity goes a long way when designing a tiny home. 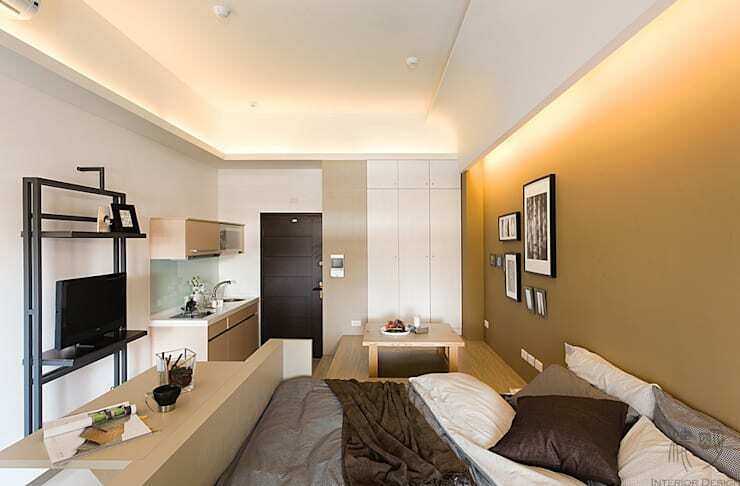 The bed takes up most of the room, but we also see there is a small dining table, television, and kitchen too. 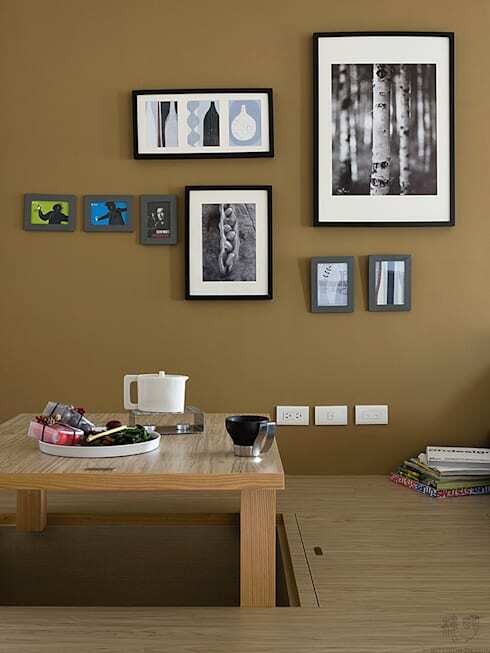 The table at the end of bed is added as well, and can be folded down when not needed. Focusing our attention on the dining space, we see that the table appears to have risen out of the floor. This is a handy addition that we’ll look at in more detail next. However, it’s in this corner that we notice the built in cupboards, adding a space and area for clothing that services the bedroom. Back at the dining table we are given a close up of its setup, and the way it is able to drop into the floor space and hide completely. 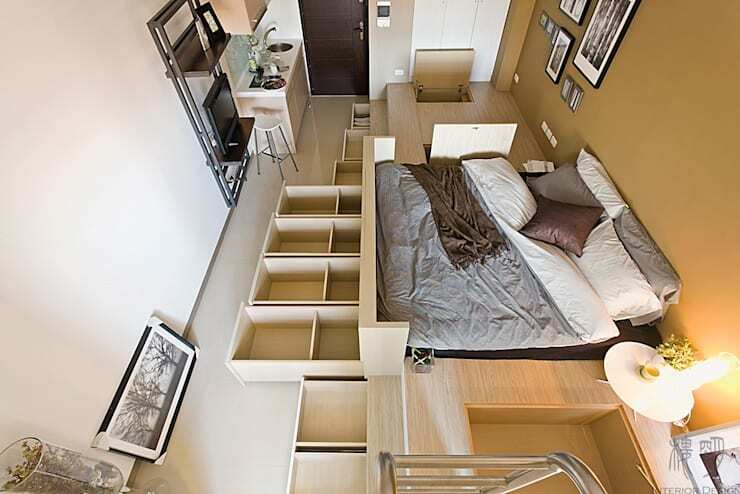 In such small apartments, this sort of modular living can really improve daily life and efficiency. The design is also rather versatile with other trap doors adjacent, providing ample storage space for other necessities. This next image truly shows us the extent to which the architects have added storage for this micro home. There are drawers underneath the bed, trapdoors in the bed platform, and plenty of space for domestic miscellany. One might tend to think that it’s impossible to live with another in such a small home, but we disagree. With the range of storage options, along with moveable furniture options, the dwelling creates ideal spaces for plenty of room for two. Follow the lead of this pair, with one reading at the fold up workspace, and another working at the dining table. Sure, this place is tiny, but it’s one of the most liveable homes we’ve seen! Coming to the end of our tour we take a moment to check out the bathroom. Surprisingly large, this bathroom offers an immense array of luxurious features, which are perfect for washing away the stresses of a long and hectic day. As this room faces the window, it was important that it let light flow through and into the main living space. This is done with a frosted glass door and a privacy blind that can be closed when in use. Back in the living room, we turn around and change our perspective to check out the rest of the apartment. Yet another surprise, as we notice there is a loft relaxation space, which boasts throw cushions and a quiet area for someone to rest and unwind. 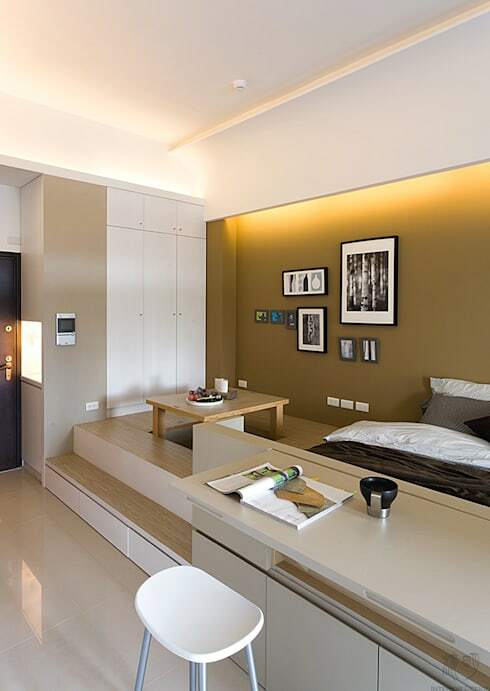 The space could also double as a guest bed if the occupants decided to host a visitor.